Yesterday, I got a message. Those three words just got me right at the heart. I dropped everything at work and excused myself from the office. For goodness sake I’ve been working nonstop day and night these past couple of weeks, I needed this moment with my son. Just half an hour! The Chinese side in me… very kiasu one. I zoomed back to the house and there he was smiling and jumping. When he saw me, his face lit up and he jumped wildly for me to pick him up. He does that every night when I come home from work and seriously, that is THE BEST FEELING in the world. Beats everything else. Sigh Daniel, just over 4 months ago, I was crying in agony because you wouldn’t leave my uterus. Now you’re starting to crawl already. Ahhhh…. I feel you Vivy! Soon, the first step, then the first time he call you Mummy and so on.. Time really flies. 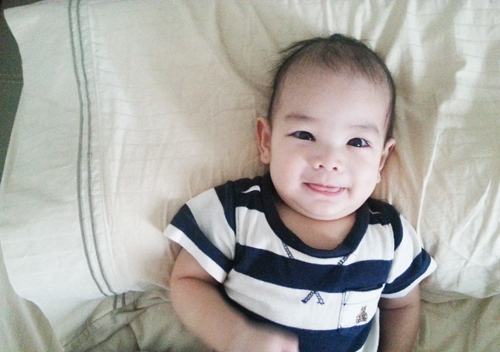 Melting tengok photo baby D tu.. Comel sangat. is he fully breastfed? he’s quite fat 😀 well done mommy V.
”The Chinese side in me… very kiasu one.” That’s racial remark and stereotype?